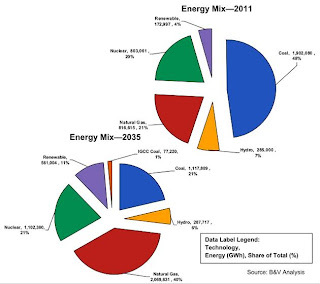 Dave Roberts at Grist has a post showing one analyst's view of the coming changes in US energy consumption (grossly understating the likely future contribution of renewables) - Chart of the day: the U.S. energy mix in 2035. It is important for everyone working or advocating around energy to understand how the power mix is expected to change in the next 20 years or so. To that end, I've pulled a chart out of the consulting firm Black & Veatch's "Energy Market Perspective," an analysis of U.S. energy markets that they update every six months. They bill it as "analytically neutral," neither conservative nor aggressive. There's an element of pretense to that, but I do think we can take this as something close to the average expectation of U.S. analysts.